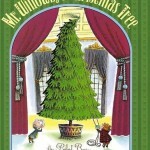 Mr Willowby unknowingly spreads festive cheer when he chops the top off his Christmas tree. 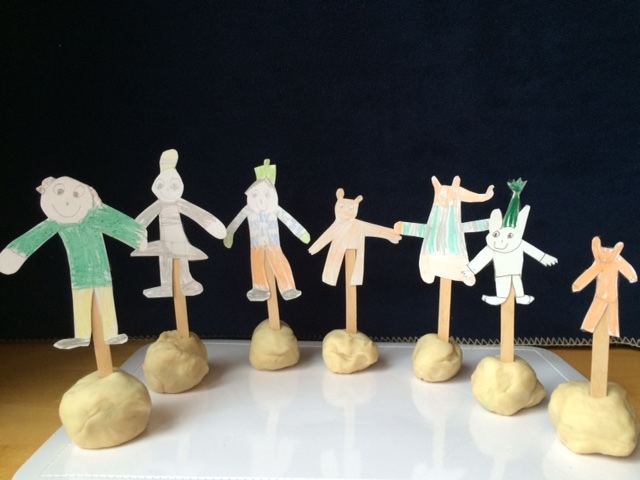 This lovely rhyming story can be used to stimulate Christmas tree arts, crafts, literacy and numeracy activities. 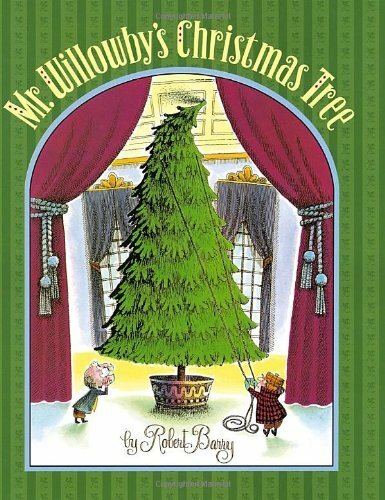 The Story: Mr Willowby’s Christmas Tree is too tall for his parlour so the butler chops the top off and gives it to the maid. It is too tall for the maid’s mantelpiece so she chops the top off and Timm, the gardener, rescues it. The sequence continues with a variety of animals taking the top off the tree until the mouse family receive the very top part. The final picture shows Mr Willowby sitting by his Christmas tree while the mouse family enjoy theirs in their mousehole. There are so many learning activities inspired by Mr Willowby’s Christmas Tree. 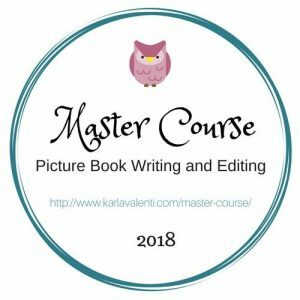 The story can be used to stimulate discussion about the difference between deciduous and evergreen trees and also the difference between different evergreen trees. Researching the history of Christmas trees is also fascinating and we found conflicting opinions on when and where the first Christmas tree was put up although most seem to agree that it was somewhere in Northern Europe. Mr Willowby’s Christmas Tree is great to use for story sequencing. You can do this with pictures but it’s more fun using real characters like soft toys or Lego or Playmobil people or animals. There are quite a few characters so it can be a challenge for little ones to sequence the story. 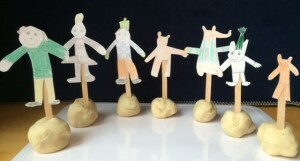 My daughter made lollipop stick puppets and did a Mr Willowby’s Christmas Tree puppet show. Triangle Christmas trees can be the result of investigations into the properties of triangles. 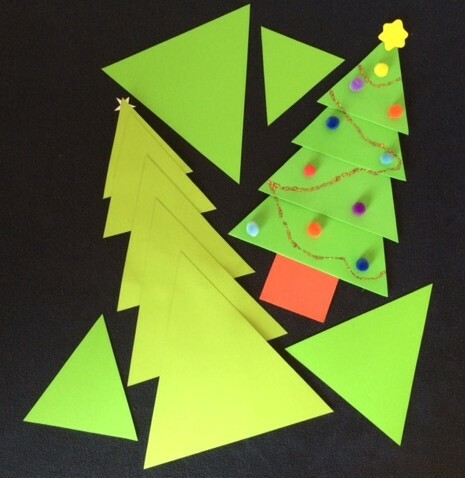 Children cut out five different size triangles and then make their Christmas tree starting with the largest triangle first. For the youngest children you can use equilateral triangles, older children will be more challenged when you use isosceles triangles. I have made the trees using both cardboard and craft foam. Mini pompoms make great baubles and glitter pens can be used to draw tinsel. The trees look lovely on a window or as a classroom wall display. Making Lego Christmas trees can help children understand how bricks are laid so that walls are stronger. 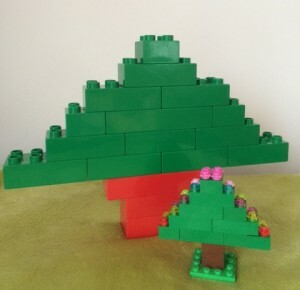 We made trees using both Lego Duplo and small bricks. The first three layers are fairly easy, the challenge comes further down when you need to make sure that your bricks aren’t going to fall apart! It is surprising how much numeracy is involved in making a pom pom Christmas tree. First you need to cut out three different sized circles with smaller holes in the middle (instructions for making pompoms). When the pom poms are finished stack them onto a pipe cleaner to hold them together. Thread Hama beads together to make lights (the light strings can be made using a repeating pattern to develop more numeracy skills). 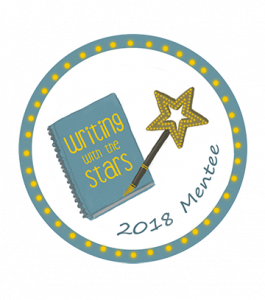 Finish by sticking glittery stones on as baubles and a craft foam star on the top. The tree looks good in a plain terracotta flowerpot or you can paint the flowerpot or decorate it with ribbon for a more festive look. Baking is a fun way to develop numeracy skills and cinnamon salt dough Christmas tree decorations add a festive aroma to your Christmas tree. Add a substantial amount of cinnamon to a basic salt dough (flour, salt and warm water), roll the dough out, then cut and decorate your shapes (don’t forget to leave a hole for the hanger). 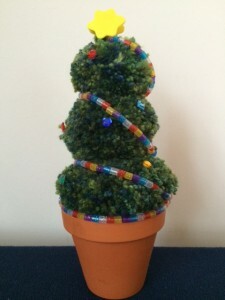 Hama beads make lovely decorations (as long as you don’t plan to bake your dough). Leave the dough to dry and paint the dried decorations with clear glue to seal them. Adding glitter to the salt dough also looks very festive. 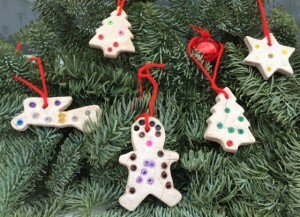 These Christmas tree crafts and activities are fun to do and incorporate lots of learning opportunities. Have you used Mr Willowby’s Christmas tree to inspire any crafts or learning activities? 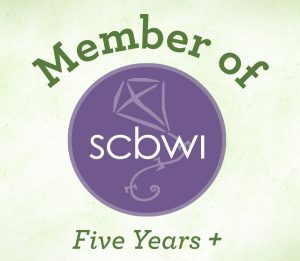 I’d not heard of that book before, but it sounds great, thanks for sharing. It’s an old book and the illustrations are vintage but the story is timeless! What a lovely story, and great crafts to go with it, will certainly be looking to get this one for next christmas. This sounds like a great book. We love to create from books! We like doing book related crafts, often my daughter comes up with her own ideas after reading a story. Mr Willowby’s Christmas Tree is a book from the US. Doing crafts with kids is a lot of fun, they’re often not so keen on the tidying up afterwards! I hope you’re all feeling better now Hannah. We probably have enough Christmas books for every day of December now! This post is fab, full of different ways to get kids talking about and learning through Christmas! Popping over from Counting Down to Christmas.